We buy circuit board fingers and pay you for their gold plating. See what other computer scrap has value and what we buy. Circuit board fingers are one of the highest density sources of value in E-Scrap. Fingers are the trimmed connector edges of a circuit board. They have no components and very little circuit board material. They pack and ship nicely. Gold plating is used on fingers because of gold's superior physical properties for external connectors. We pay you based on the gold content on the plated portion of the fingers. The thickness of the gold varies from board to board. As with all E-Scrap, fingers from older boards, or from high performance boards (such as from military, enterprise or telecommunications equiptment) typically contain more gold. To get started, please contact us, or send us details about your fingers for a price estimate and shipping arrangments. The minimum shipping quantity for shipping fingers is 5 pounds to ensure your profitability. The portion of a circuit board that is considered a "Finger." 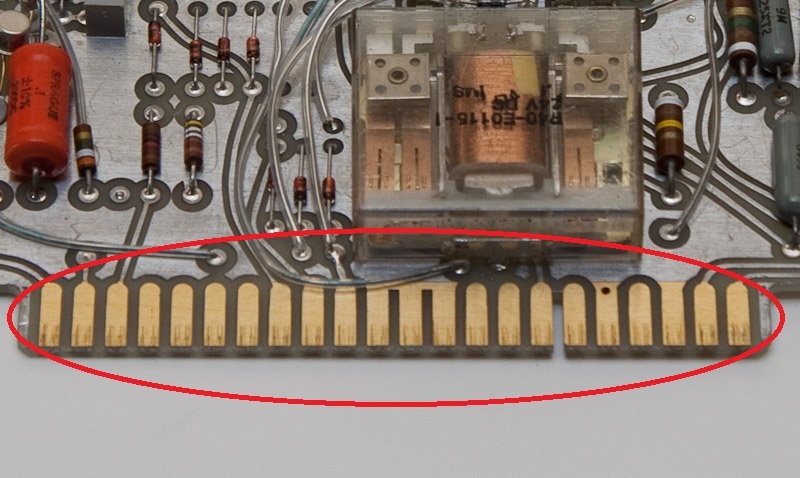 Trimming off only these pieces of the board results in high density E-Scrap.